Excellent quality. Easily to wash and care for. Give your bedroom a completed look with this microfiber bedskirt. 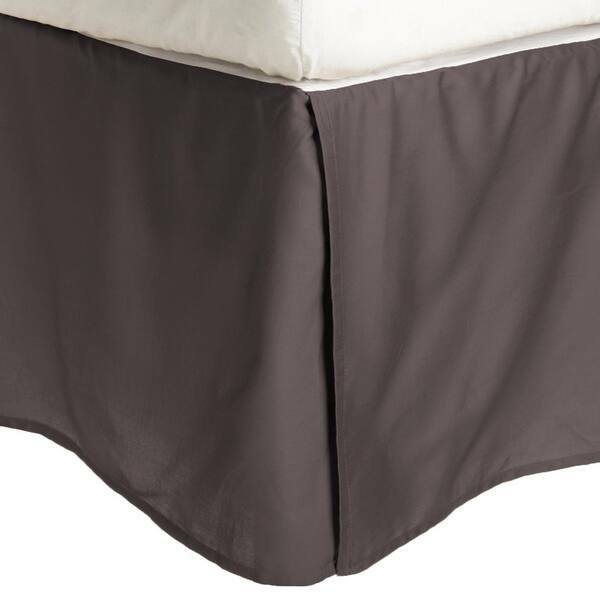 The bedskirt is designed to be wrinkle resistant to keep a crisp, sharp look at all times. Choose from a variety of colors and sizes to find the perfect microfiber bedskirt for your bedroom. Toss the bedskirt in the washing machine for quick and easy cleaning when needed. Whether you choose black, blossom or blue, you can't go wrong with the affordable Superior Solid Wrinkle Resistant Microfiber 15-inch Drop Bedskirt. These are designed to maintain their crisp shape and bring a clean, orderly look to any bedroom in which they're used. This is better than the last bedskirt I bought in that the platform part fits the top of the boxsprings correctly, not hanging over the edge of the bed too much. The drop is just the right length and the only thing I would improve is the thickness of the white skirt. It washes well and didn't need ironing. Great bedskirt. Bought sheets this color but the set didn't have coordinating bedskirt. Found this took a chance matching the color and it was spot on. Great fit too. Sometimes the bedskirt is too wide or long and you end up having to fold in the middle, or the mattress causes it to slip when placing it back on the foundation. This didn't slip at all and was the easiest skirt I've ever used. I want to get a few different colors in case I change my quilt, that's how impressed I am with the product. The bed skirt looks good. However, when we were putting it on, just the slightest pull too hard will rip the material under your mattress. Very thin and dainty. Overall the skirt is good quality. The microfiber portion ironed up easily and looks as though it will remain wrinkle-free. The only problem I had was when I accidentally touch the mesh portion with a medium-heat iron. It instantly melted, leaving small holes in two places. I had to hand-stitch one that is along the edge to reinforce that area so that it doesn't tear easily. There should be some sort of warning about that, or the mesh should be of a more substantial material. If you are planning on ironing it, don't bother buying it. Most of the fabric you cannot iron and after one washing, the threads are already coming out. This is a very nice bedskirt however the colors are not exact. I had to endure of a few returns in order to find the color i needed which had to be black as the colors are quite different than shown. But black is expensive looking and nice. It fits great but the fabric used that lays under the mattress looks like it will rip easy if you pull too hard. I am still crossing my fingers on the wrinkle resistant part when it comes out of the wash because when it came out of the package it was nothing but wrinkles. For the price it was a good buy. This bedskirt is exactly as pictured. I ordered it in white, and I'm very happy with it - the material is soft, bright white (not dull or off-white), and good quality, not thin, stiff, or flimsy the way that some bedskirts are. Bought this bed-skirt for my grandson in tan. Looks fabulous with his charcoal grey motif! Also, the bed-skirt is a great concealer of the "stuff" that gets pushed under the bed! And because I know he won't iron, the microfiber is perfect for not wrinkling. Mine are on my bed right now wrinkled. Fits very well and came well packaged. Worked great for our adjustable bed. Like the looks but wants to slide on mattress. Wonderful quality, would purchase again! Love this!!!! Great for the holidays, my family is always impressed with the look and quality​!!! This look great on the bed. It wasn't wrinkled at all, just a very straight clean look. Color was perfect. This bedskirt is okay. I won't bother to return it, but I'm not overly thrilled with it. "The charcoal looks to be brown on my monitor, but I always considered charcoal to be a shade of grey. Is the charcoal color brown or grey?" I have not used it yet but I took it out of the package and looked at it in the real daylight and it is what I would call medium gray. I think of charcoal as a deep/dark gray but I would call it medium. In the artificial light in my bedroom it may ever so slightly have a brownish color but when I put it next to my gray sheets it does not look brown but medium gray. It is a lovely gray color! No brown at all. No brown. Nice gray color. "Do these bedskirts have slits in the corners? My bed has a foot board"
Yes, they do. My bed has a footboard too and this skirt fits nicely. "Do you sell any wrap around or elastic bedskirts or just the old fashioned flat ones that go on top of the box spring?" "how many inches is the drop?" The drop length is approximately 15" inches. "Is the pink a pastel pink as the picture indicates or a hot pink?" Hello sromaine, in my opinion, this item features a pastel pink. Please feel free to contact us again with any further questions. Thank you for shopping with us! "Does this bed skirt have a flat top that fits over the box spring or is just a wrap around style?" Hello Janeps907, this bed skirt does have a flat top. Have a great day! "Does the bedskirt have split corners?" Hello tonyalanae, this item features split corners as well. Please feel free to contact us again with any further questions. Thank you for shopping with us!